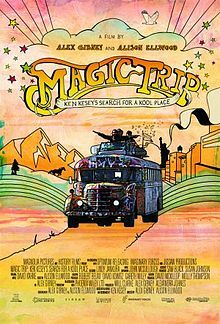 In the early 1960’s, Ken Kesey and the Merry Pranksters decided they would make a film about a cross-country trip they would undertake. After the journey, when they tried to edit the film, they found they couldn’t synchronize the sound and the images. Perhaps this had something to do with the fact that they were tripping on LSD most of the time they were filming. Recently, Alison Ellwood and Alex Gibney used the surviving footage as the basis for a documentary about Kesey and about the 1960’s. In 1964, Kesey and a group of his friends, inspired by Jack Kerouac’s On The Road, decide to travel across the country from California to New York. They renovate an old school bus and paint it bright colors. They name it “Further”, and they call themselves “The Merry Pranksters”. They manage to get Neal Cassady – the “Dean Moriarty” from On The Road – to be their bus driver. Cassady is on speed much of the time, so he talks incessantly and is constantly gesturing with his arms. The trip is largely a success, but it is not without problems. A woman has a mental breakdown and has to be sent home. Another woman, who is pregnant, eventually decides that she is not enjoying herself and eventually drops out. When the pranksters reach New York, they seek out their hero, Jack Kerouac, only to get a decidedly chilly reception from him. They go to the World’s Fair, thinking it will be a good place to trip, only to find it a bit dull. They then travel to upstate New York, where Timothy Leary has a mansion, where he and others carry out experiments with LSD. When the Pranksters arrive, however, most of the people there, including Leary, hide from them. (One of the Pranksters comments that these people seem “upper class”.) The only one who talks to them is Richard Alpert (“Ram Dass”), who creeps them out. When the Pranksters return to California, they begin holding parties called “acid tests”. These start to attract large numbers of people. The Pranksters become disenchanted with Cassady, who seems to be all talk and nothing else. One day he is found dead lying alongside a railroad track in Mexico. Kesey eventually seems to sour on the drug culture he helped create, although he never expresses any regrets about what he did. He moves to Oregon, where he settles down on a farm with his wife and children. It’s funny how society tries to appropriate artists after they die. A statue of Kesey now stands in downtown Eugene, where environmental activists have sometimes been brutalized by the police. At least one of these incidents took place across the street from the statue. Magic Trip is part road movie, part cultural history, and part morality tale. I highly recommend seeing it. This entry was posted on October 4, 2011 at 5:46 am and is filed under Beats, Cinema, Eugene, Jack Kerouac, Ken Kesey, Literature, Oregon, Popular Culture. You can follow any responses to this entry through the RSS 2.0 feed. You can leave a response, or trackback from your own site.